Reciprocating Internal Combustion Engines Does your utility need a permit? The Kentucky Municipal Utilities Association wants you to be aware of the RICE Regulations. Please take the time to review the information below on RICE and how to determine if your system needs to register equipment. The fines for non-compliance are significant (up to $25,000 per day per violation for not registering a RICE engine.) KMUA wants to ensure that all association members are in compliance. Pollutants can enter the air any time water comes into contact with it during a treatment process, including during evaporation, aeration, and agitation. Chlorination also has the potential to release pollutants into the air. Even common equipment can release air pollutants, like generators, boilers, or heaters. The Kentucky Division for Air Quality (DAQ) and U. S. Environmental Protection Agency (EPA) have regulations in place to lessen harmful impacts of pollutants that are released into the air. WHAT ARE RECIPROCATING INTERNAL COMBUSTION ENGINES OR RICE? RICE use pistons that alternatively move back and forth to convert pressure into rotating motion. They’re commonly used at power and manufacturing plants and water and wastewater systems, RICE are also used in emergencies to produce electricity and pump water. The U.S. Environmental Protection Agency (EPA) has recently finalized new air quality regulations that place requirements on owners and operators of a wide variety of stationary RICE. WHY DOES EPA REGULATE RICE? RICE are common combustion sources that collectively can have a significant impact on air quality and public health. The air toxics emitted from stationary engines include formaldehyde, acrolein, acetaldehyde and methanol. Exposure to these air toxics may produce a variety of health issues. whether the engine is located at an area source or major source and whether the engine is a compression ignition or a spark ignition engine. “Spark ignition” engines are further subdivided by power cycle - -i.e., two vs. four stroke, and whether the engine is “rich burn” (burning with a higher amount of fuel as compared to air) or “lean burn” (less fuel compared to air) engine. A DIVISION OF AIR QUALITY PERMIT MAY BE REQUIRED FOR YOUR MUNICIPAL UTILITY. A DAQ permit or registration may be required to construct and operate a source of air pollutants. The type of permission depends on the amount of air pollutants that could be released if it did operate all processes and equipment 24 hours a day, 7 days a week at full capacity. More information on the different air permitting levels can be found in Typical Permits at a Glance, available at DCA.KY.gov in the Quick Links. HOW CAN I FIND OUT IF MY SYSTEM NEEDS A PERMIT? To find out if your water or wastewater plant needs an air quality permit, you have to calculate the potential air emissions from each piece of equipment and process. The Air Quality Potential-to-Emit Compliance Guide, available at DCA.KY.gov under Quick Links, explains how to complete these calculations and put together an air quality application. In addition to DAQ requirements, there may be federal regulations that require submission of at least an air quality registration. Federal regulations may apply to any plant based on equipment and processes, such as the use of reciprocating internal combustion engines (RICE). WHERE WOULD RICE BE FOUND AT MY SITE? RICE can be found in things like dryers, fire pumps, irrigation pumps, and air compressors. 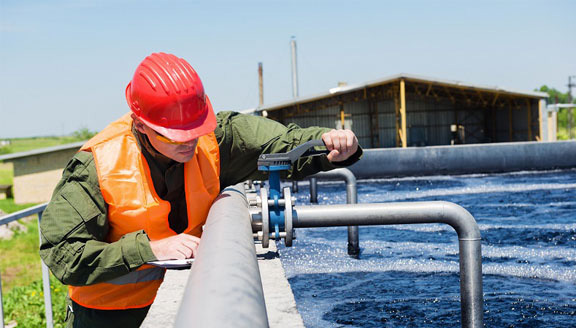 Many wastewater treatment and drinking water plants have a “back-up” engine or generator that is used in case of emergencies to keep the plant running if the power goes out. Even these emergency engines may have requirements under RICE rule if they are non-mobile, or do not move during a 12-month time period. What kind of fuel does the engine use? What is the horsepower of the engine? Is the engine a two-stroke or four-stroke? If gas-fired, is it rich burn or lean burn? What date was the engine made or reconstructed? How is the engine used – in the wastewater treatment process, emergency use only, peak shaving, etc.? Is the treatment plant a major or minor source of air pollutants? With these questions answered, you can use the EPA’s Regulation Navigation Tool to help find the federal regulation and requirements that may apply to your engine. The tool and additional information can be found at www.epa.gov/ttn/atw/icengines/comply.html. The last question above may give you pause if you are unfamiliar with air quality. Calculating air pollutant releases will help to identify whether the plant is a major or minor source. The terms minor or major source are related to the amount of potential air emissions you could release and the type of permission your plant requires. If you have any equipment or processes subject to a federal regulation, no matter how little air pollutants are released, you must apply for, at minimum, an air quality registration. DAQ reviews applications for completeness, determines the applicable state and federal regulations, and then issues permits or authorizations accordingly. WHERE CAN I GET HELP WITH RICE PERMITTING? The Division of Compliance Assistance (DCA) can help with the air permitting process, including helping you find which regulations apply to your plant. DCA staff are available to provide on-site assistance and training. Sources: https://www3.epa.gov/region1/rice/ and Kentucky Division of Compliance Assistance.